Wow, has it been a busy week and it's not over yet. I got my new House Mouse Stamp of the Month this week and couldn't wait to use it. This is the way I've been feeling!! I used the 5-in-one card cover template for this and made an envelope to match. The card is Soft Sky and I did the faux dry embossing on it by punching out 1/2" circles and gluing them on. 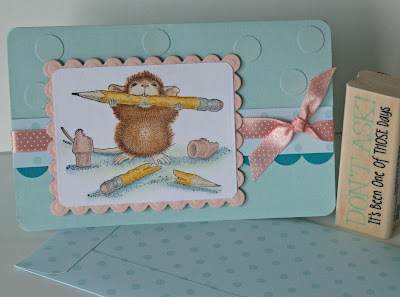 The patterned paper is the Soft Sky DSP that I also used for the envelope. I made the scallop edge in Taken with Teal and the Slit Punch this time, because I wanted bigger scallops. The ribbon I found at Michaels. The mouse is colored with my Prismacolor Pencils and gamsol and I used my Nestibilities to cut it out. I layed mousie on Blush Blossom. Enjoy!! Friday we are going to Epcot.